rounding granulosa cells as the zona pellucida is deposited (see Fig. 22.5). At the same time, slender processes from the granulosa cells develop and project toward the oocyte, intermingling with oocyte microvilli and, occasionally, in-vaginating into the oocyte plasma membrane. The processes may contact the plasma membrane but do not establish cytoplasmic continuity between the cells. When the stratum granulosum reaches a thickness of 6 to 12 cell layers, fluid-filled cavities appear among the granulosa cells (Fig. 22.6). As the hyaluronic acid-rich fluid called liquor folliculi continues to accumulate among the granulosa cells, the cavities begin to coalesce, eventually forming a single, crescent-shaped cavity called the antrum. The follicle is now identified as a secondary or antral follicle. The eccentrically positioned oocyte, which has attained a diameter of about 125 /xm, undergoes no further growth. The inhibition of growth is achieved by the presence of a small, 1- to 2-kDa peptide called oocyte maturation inhibitor (OMI), which is secreted by the granulosa cells into the antral fluid. A direct correlation is observed between the size of the secondary follicle and OMI concentration. The concentration is highest in small follicles and lowest in mature follicles. The follicle, which was 0.2 mm in diameter as an early secondary follicle when the fluid first appeared, continues to grow and reaches 10 mm or more in diameter. 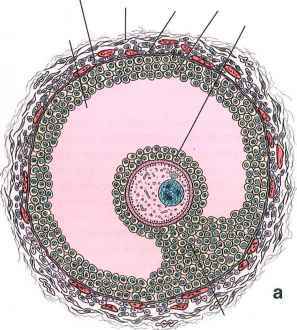 As the secondary follicle increases in size, the antrum, lined by several layers of granulosa cells, also enlarges (Fig. 22.7). The stratum granulosum has a relatively uniform thickness except for the region associated with the oocyte. Here, the granulosa cells form a thickened mound, the cumulus oophorus, which projects into the antrum. The cells of the cumulus oophorus that immediately surround the oocyte and remain with it at ovulation are referred to as the corona radiata. The corona radiata is composed of cumulus cells that send penetrating microvilli throughout the zona pellucida to communicate via gap junctions with microvilli of the oocyte. During follicular maturation, the number of surface microvilli of granulosa cells increases and is correlated with an increased number of LIT receptors on the free antral surface. Extracellular, densely staining, PAS-positive material called Call-Exner bodies (see Fig. 22.6) may be seen between the granulosa cells. These bodies are secreted by granulosa cells and contain hyaluronic acid and proteoglycans. 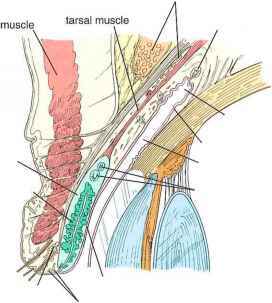 The mature follicle, also known as a Graafian follicle, has a diameter of 10 mm or more. Because of its large size, it extends through the full thickness of the ovarian cortex and causes a bulge on the surface of the ovary. As the follicle nears its maximum size, the mitotic activity of the granulosa cells decreases. The stratum granulosum appears to become thinner as the antrum increases in size. As the spaces between the granulosa cells continue to enlarge, the oocyte and cumulus cells are gradually loosened from the rest of the granulosa cells in preparation for ovulation. The cumulus cells immediately surrounding the oocyte now form a single layer of cells of the corona radiata. These cells and loosely attached cumulus cells remain with the oocyte at ovulation.